After a year on the Atlanta Falcons' coaching staff, Hamdan is back as the Huskies' new offensive coordinator. Bush Hamdan hesitated. Some 14 months ago, when the opportunity came to coach in the NFL, to join an Atlanta Falcons team coming off a Super Bowl run, to be the position coach for MVP Matt Ryan, Hamdan says he wasn’t immediately sold on the job. He wasn’t sure he should leave the University of Washington and his mentor, Chris Petersen. 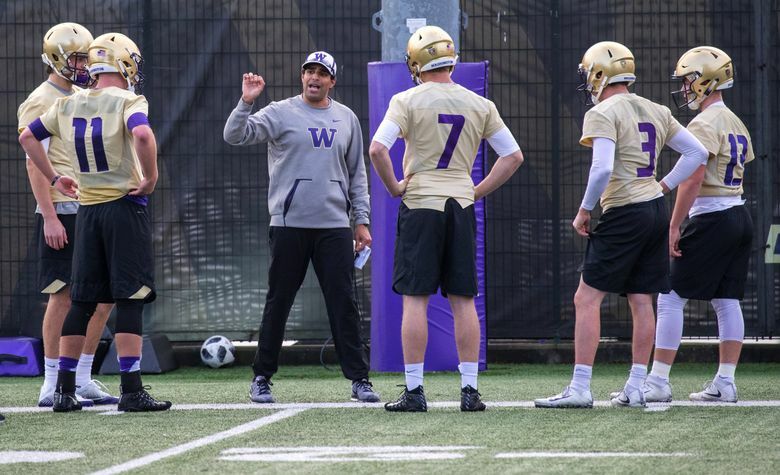 Hamdan, who played QB for Petersen at Boise State, had been on Petersen’s staff in 2015 and 2016, first as a quality-control assistant and then as the wide receivers coach during the Huskies’ breakthrough season two years ago. In early 2017, Hamdan eventually agreed to join the Atlanta staff as the quarterbacks coach, continuing his vagabond career. In Atlanta, Hamdan worked for Falcons head coach Dan Quinn, the former Seahawks defensive coordinator, and alongside former Washington coach Steve Sarksian, who in 2017 took over as the Falcons’ offensive coordinator. 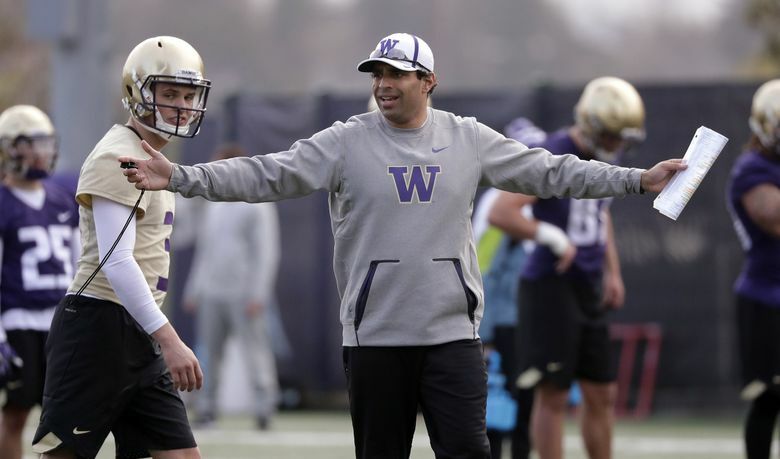 Hamdan, now 32, returned this winter to be the Huskies’ offensive coordinator and quarterbacks coach. He replaces Jonathan Smith, the new head coach at Oregon State. Given the chance to return to UW, Hamdan didn’t hesitate. While it wasn’t an easy decision to leave Atlanta — because NFL coaches don’t have to recruit, they have more free time than college assistants — Hamdan was it was a “no-brainer” to come back to Petersen. “I’m where I am today because of Chris Petersen,” he said. During his first UW tenure, Hamdan was one of the team’s most popular coaches. He grew close with receivers John Ross III and Dante Pettis, and remained in touch with many of the current players last season. “Bush is one of my favorite coaches on the offense inside and outside of football,” junior receiver Aaron Fuller said. This is Hamdan’s 10th different coaching position in 10 years. He was the co-offensive coordinator at Arkansas State in 2013, and the offensive coordinator and play-caller at Davidson in 2014. Back at UW, Hamdan isn’t going to overhaul Petersen’s offense. But he does have the freedom to implement his own ideas. More pressing for Hamdan is pushing established starter Jake Browning. There is no competition for the starting job — that, without a doubt, is Browning’s — but Hamdan is trying to make the senior standout uncomfortable in a positive way. “Make no mistake: We’re here to challenge Jake Browning every single day, and I want him kind of feeling a little bit of pressure as well,” he said.